Roasted vegetables are definitely my go-to when it comes to side dishes at dinnertime. I just love how easy it is to toss some veggies with some seasoning, crank up the oven and let the magic happen without much involvement from my part. You know I am ALL about easy. 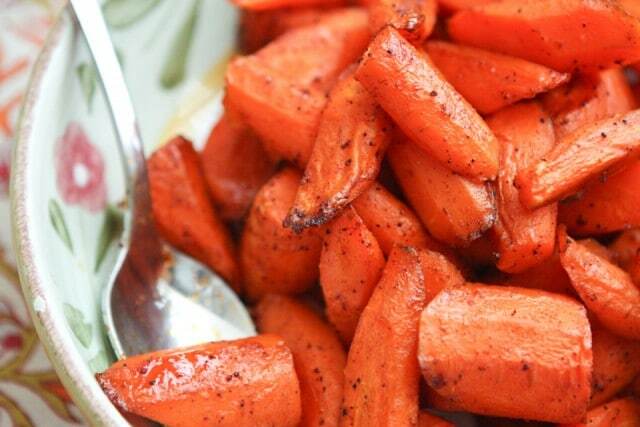 I make these roasted carrots all the time. I recently made them to serve with this Slow Cooker Asian Citrus Pork Tenderloin recipe. Since carrots are naturally sweet I don’t need to add too much (pure) maple syrup to them, just enough to give them some more flavor. The chili and smoked paprika gives them a subtle kick of spice, but not in a way that little ones can’t enjoy them. In fact, my little ones LOVE these carrots, which is a big reason I try to make them often. 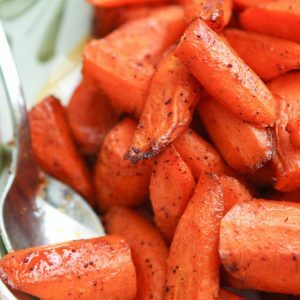 These roasted carrots go with everything. You can easily double (or triple) the recipe if you are serving a large group (great holiday side dish!). For a weeknight meal they pair up perfectly with these Mini Cheddar-BBQ Turkey Meatloaf Muffins or homemade baked chicken nuggets. They would also round out a nicer Sunday dinner meal like this Mustard Pork Loin Roast. 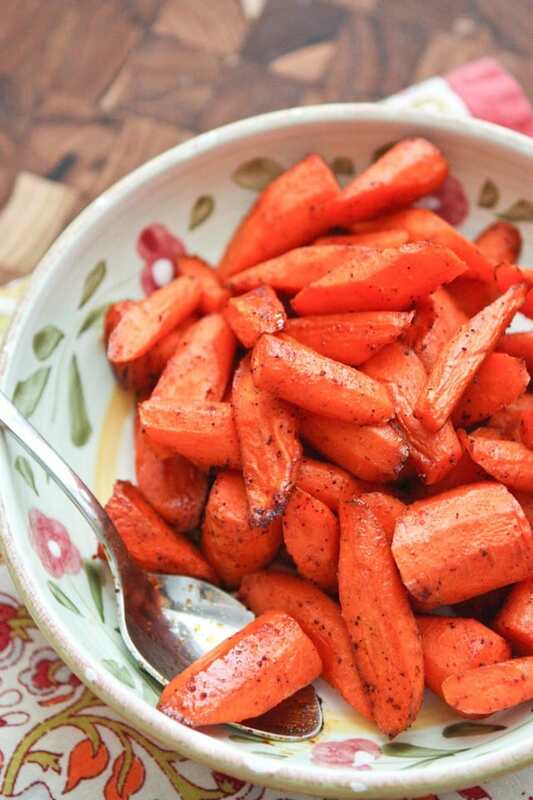 In a large bowl, toss together carrots with olive oil, pure maple syrup, smoked paprika and chili powder. Spread them out in a large rimmed cookie sheet and sprinkle with salt and pepper. Roast in oven for 20 min or until they start to brown and caramelize. Follow Aggie’s Kitchen’s board Veggie Love on Pinterest. I have a serious carrot problem…I can eat a whole bag in one sitting, no problem 🙂 . Trying! I love the chili powder and paprika on these, with the maple syrup! I often do honey + cinnamon + flaky sea salt. Mmmm, chili maple sounds DELICIOUS! I can’t wait to try this! Love the chili maple combination! 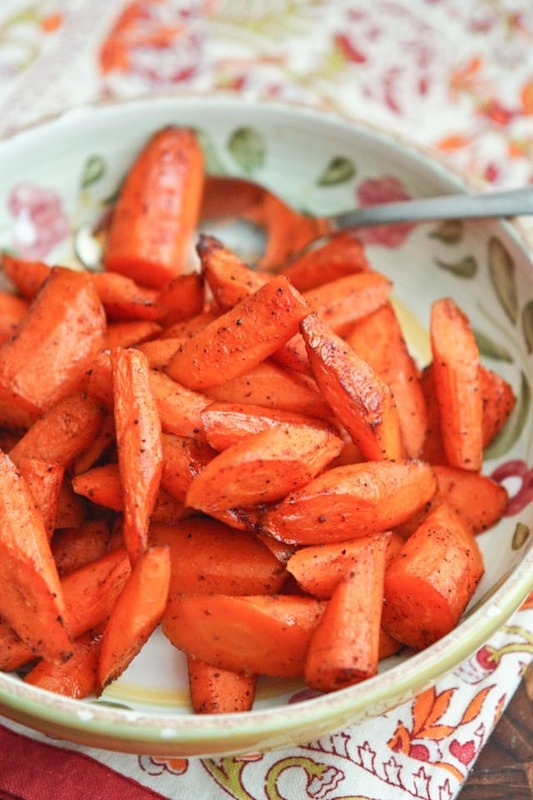 We love roasted carrots but it can get boring . Thanx for a new flavor on our carrots. Rich loves cooked carrots and asks for them all the time!! I know my boys would love these – especially digging the smoked paprika! I love carrot dishes that have a little bit of spice to offset their sweetness like this one!